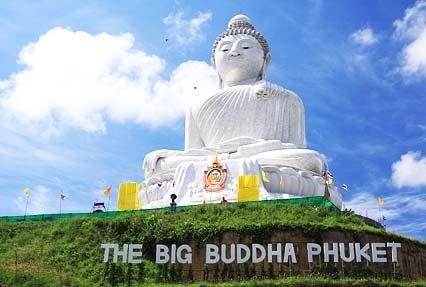 Thailand is a medley of colorful Buddhist temples, chanting monks, friendly elephants, tantalizing cuisines, world class scuba diving and thrilling adventures. Tourists are pampered with luxurious resorts, full moon beach parties, exhilarating nightlife, indulging Thai massages and other excitements. The Land of Smiles creates cherished memories of wonderful holidays. 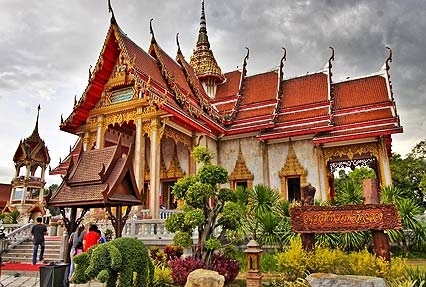 The exotic Thailand tour delights comprise of the beautiful Phuket, thrilling Krabi and the fusion of old world charm with modern achievements; Bangkok. Phuket City Tour & Phi Phi Island Tour. Optional tour of Safari World and Marine Park. Exotic Thailand tour starts with your arrival at the Krabi airport. Meet our tour representative at the airport terminal. You will be escorted and transferred to one of our listed hotels. Check-in at the hotel and relax. The day is free, choose to indulge in lavish comforts of your hotel. The island is spectacular and you can explore on your own. Krabi is a province on southern Thailand's Andaman coast. The ethereal beauty is blessed with silky white sands, turquoise waters and pristine ambiance. Here islands seem to rise out of the azure waters of the Andaman Sea. Some secluded beaches are only accessible by bright hued long tail boats. Krabi pleases its visitors with hot springs, a wildlife sanctuary, limestone cliffs, sea caves, thriving coral reefs and exotic marine life. Explore the environs, interact with amiable people, try out adventures or savor delectable food and shopping. After spending a pleasant day return to the hotel for overnight stay. Second day of the tour starts with a hearty breakfast. Get ready for a day of excitements. 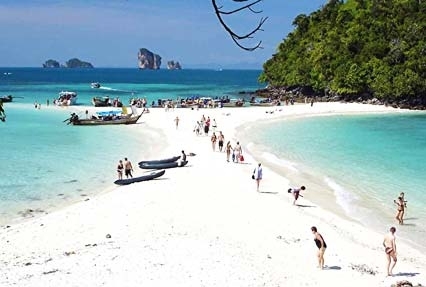 Proceed for the Four Island Tour of Krabi taking to Koh Gai, Koh Tup, Koh Puda and Phra Nang Bay on Railay peninsula. Explore the beautiful Ko Gai also known as Chicken Island owing to its unique shape. Here explore the lovely Pranang Beach. Next Island is Koh Tup which is connected by Koh Gai by a sandbar. Koh Puda is spectacular. The views are amazing and you shall feel yourself in an isolated heaven. End the island tour with the blissful Phra Nang Bay on Railay peninsula. This beach is inaccessible by road. When you view the bay, you shall understand why it is considered to be one of the most beautiful strips of sand in the world. After an exciting tour return overnight to Krabi. On the third day of Thailand Extraordinaire tour, start the morning with delectable breakfast. After your meal, check-out of the hotel and get transferred to Phuket. Check into the hotel and spend the day at your leisure. Named as 'Pearl of Andaman', Phuket is the original flavor of tropical holidays of sun, sand and sea. Its biggest allure is that there is everything a traveler desires. From rainforests, sandy beaches, vibrant culture, adventures and memorable experiences, Phuket is an ultimate recipe of unforgettable holidays. The range of activities and places to visit is remarkable. Explore on your own. Everything is easy to navigate and the friendly people will guide you. Return to your hotel for an overnight stay. On you fourth day of Thailand Extraordinaire, tour start the morning with a sumptuous breakfast. Post breakfast, get ready for a Phuket City Tour. During the city tour visit the Portuguese style buildings and colorful markets offering attractive bargains. For history of the area Wat Chalong is the best place to visit. It is one of the 29 most important Buddhist temples in the world. Enjoy the serenity, talk to smiling monks and feel the bliss of the divine. Next you visit the beautiful Rawai Beach. The popular beach is the hub of moored long tail boats. The azure waters are the getaway to other islands tours and adventures. Sea Gypsy village near the Rawai beach is a community of seafarers. These hard working humble people survive on fishing. Here you can see age old coastal village life. Also visit the Cape Promthep. The beautiful icon of Phuket is nestled at an elevated location. It is amazing place to watch beautiful sunsets. The tall palms, cerulean waters and nearby islands are few of the allures. In a city tour you shall have covered the most popular attractions. The rest of the day is at leisure. Get ready for your own exploration. The adventure shacks on the beaches are amazing. Try out snorkeling and other activities. The food joints are tempting. Delicious platters of spicy fares are available. Return to hotel for overnight stay. Start the fifth day of your tour with appetizing breakfast. Post breakfast you will be taken to the beautiful Phi Phi Island. When you step foot here you shall understand why most tourist believe it to be the most enchanting island of Thailand. Tourists are transferred to this fascinating island in ferry. The heavenly beauty has been the location of the famous movie "The Beach". Enjoy the views of Maya Bay landscapes. Lunch is organized at the beach side hotels. Post lunch you will be taken to a secluded portion of the beach to enjoy water activities like swimming, snorkeling etc. After the well spent day in the blissful island return to the hotel in Phuket for overnight stay. Day six of your tour takes you to Bangkok. Enjoy a hearty breakfast. After your meal, check out of the hotel. You will be transferred to Phuket Airport for your flight to Bangkok. Check-in to your hotel. Get fresh and get ready for a temple and city tour of Bangkok. 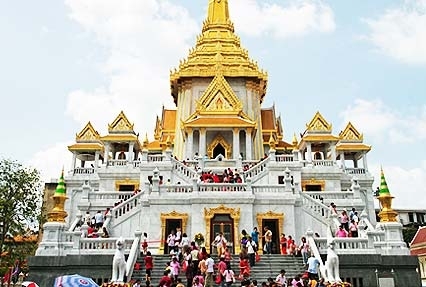 The beautiful capital city Bangkok takes great pride in a large number of fascinating temples. The cultural city has prominent temples like The Golden Buddha Temple and Marble Buddha Temple. These holy temples are intriguing architectures with various artifacts decorating the premises. After the exploration of the mesmerizing heritage of Thailand return to hotel for overnight stay. Day seven of your tour will be planned according to your choice. You can opt for a tour of safari world and marine world or a day of your leisure. If you choose to be at leisure; you can enjoy sightseeing museums and palace, shopping, rides in the canals or anything you wish. If you choose the tour, after breakfast proceed to enjoy an action packed day. Explore the exotic flora and fauna at safari world. At one place you can visit a great variety of animal species. Enjoy viewing the exotic wildlife of the park from close quarters. Continue to the Marine Park to enjoy amazing shows like Ski Dhow. 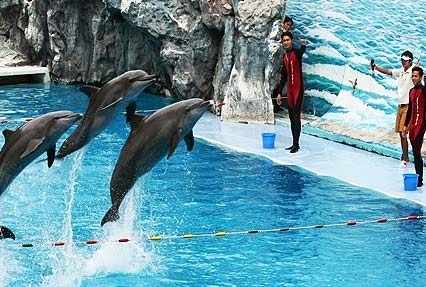 Dolphin Show, Sea lion, Bird, Elephant and Orangutan show, Hollywood cowboy stunt show etc. Return to the hotel at night. Day 8 is the last day of Thailand Extraordinaire tour. After breakfast you will be transferred to Bangkok International Airport for your flight back home. Return home with cherished memories of pleasures of the Land of Smiles.